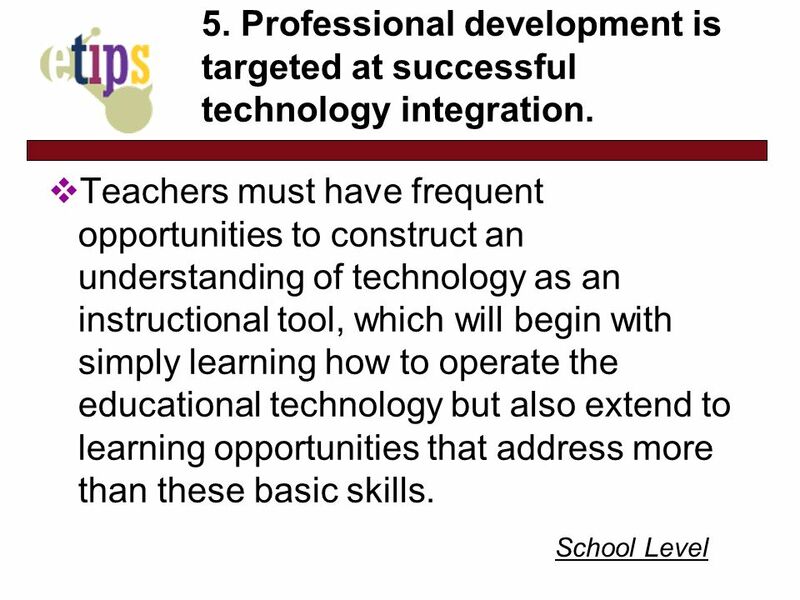 ETIPs Educational Technology Integration Principles: A set of principles to guide teachers in their instructional decision making about integrating educational. 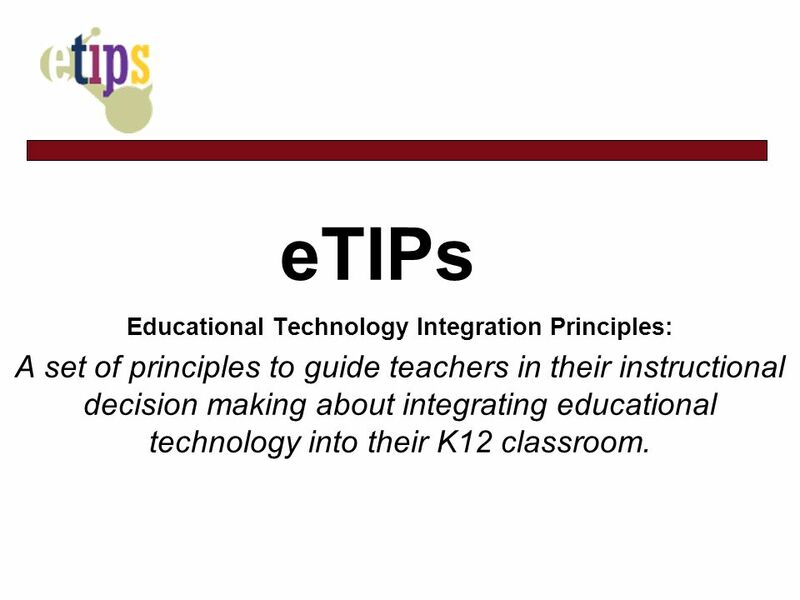 1 eTIPs Educational Technology Integration Principles: A set of principles to guide teachers in their instructional decision making about integrating educational technology into their K12 classroom. 2 Classroom Level Premise Technology integration requires the time and attention of teachers in the role of instructional designers. Educational technology does not possess inherent instructional value; rather, the value that is added to the teaching and learning processes is designed into those processes by a teacher. 3 Classroom Level 1. 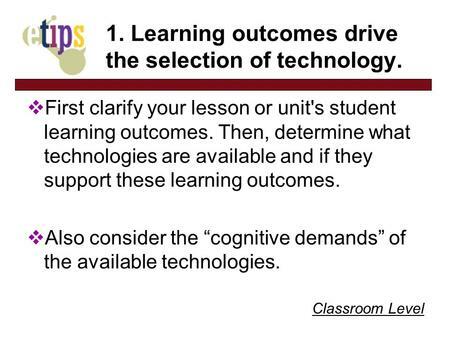 Learning outcomes drive the selection of technology. First clarify your lesson or unit's student learning outcomes. 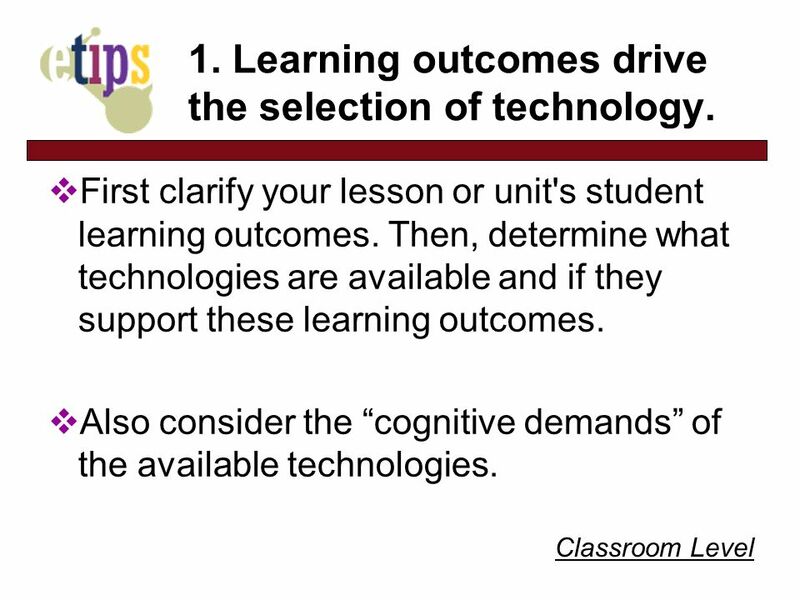 Then, determine what technologies are available and if they support these learning outcomes. 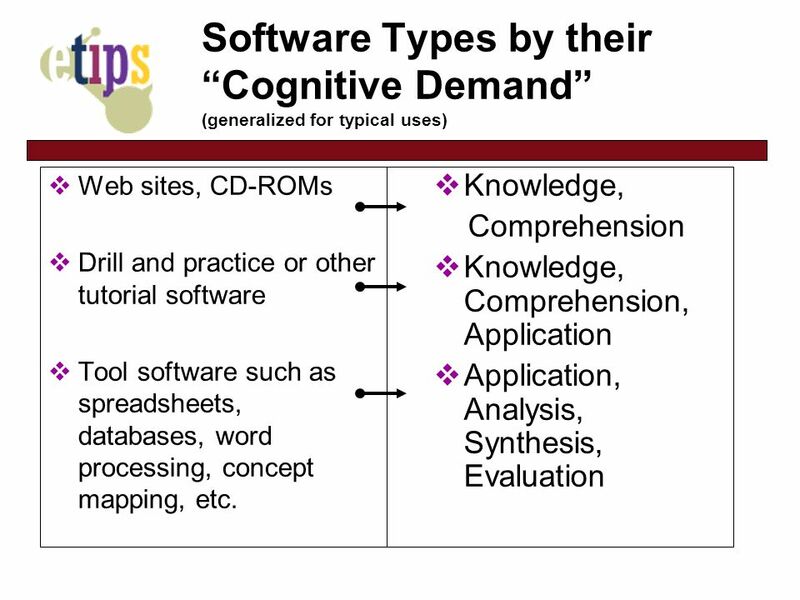 Also consider the cognitive demands of the available technologies. 5 Classroom Level 2. Technology use provides added value to teaching and learning. For Teaching adding value might mean individualizing instruction or making it more responsive to students questions and interests, or providing additional resources of information so instruction is more real world, authentic or current. 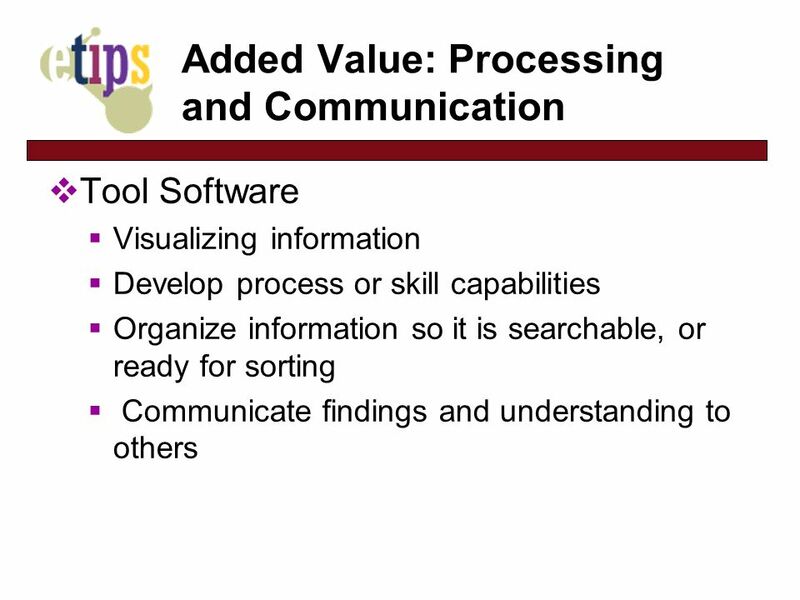 For Learning adding value might mean accessing data, processing information or communicating knowledge that without technology would be impossible or less viable to do. 10 Classroom Level 3. Technology assists in the assessment of the learning outcomes Technology can assist teachers in collecting formative and summative data about student learning. Whereas some software or hardware may actually collect the data and help to analyze it, other software may help students produce a product to show what they know and can do. 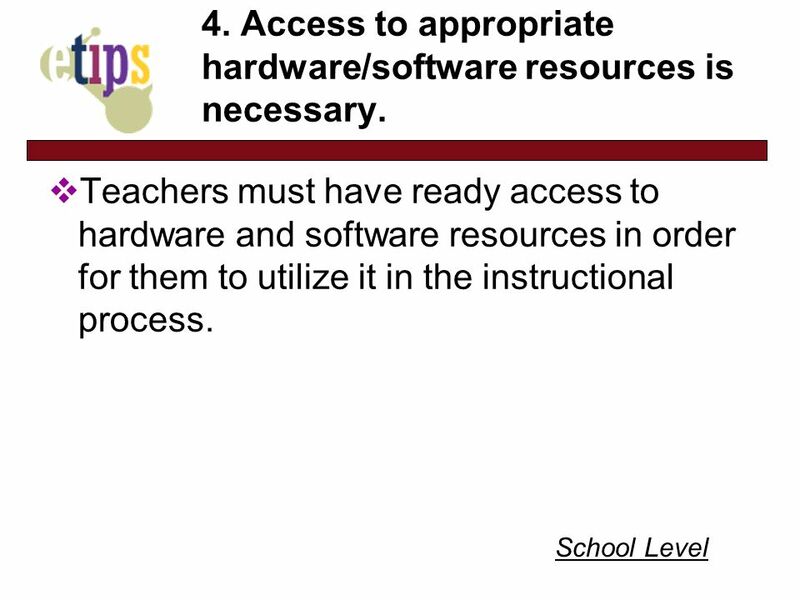 11 School Level Premise Technology support facilitates integration. Technology support encompasses both technical and instructional domains. Teachers need facilities, and staffing for technical and instructional support, as well as incentives and opportunities to provide feedback in both of these domains. 15 6. Professional Community enhances technology integration and implementation Teachers are asked to reflect on the role of technology in the school and the support they receive. They discuss educational technology with their peers and these thoughts are actively and systematically collected; this feedback is used to plan for future educational technology use and to improve the quality of technology support. 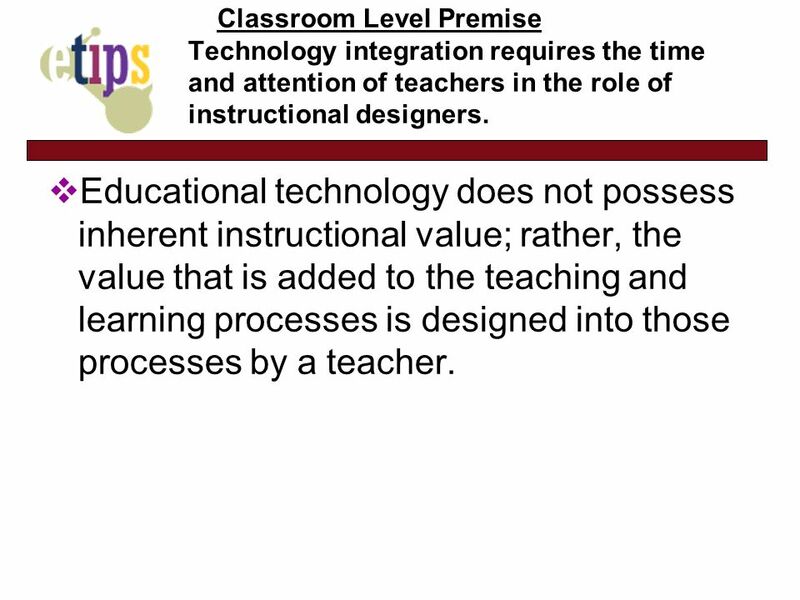 Download ppt "ETIPs Educational Technology Integration Principles: A set of principles to guide teachers in their instructional decision making about integrating educational." Ed-D 420 Inclusion of Exceptional Learners. Chpt 7 ~ Differentiating Teaching ADAPT Strategy to Analyze and Differentiate Teaching for Individuals and. Classroom Level 2. 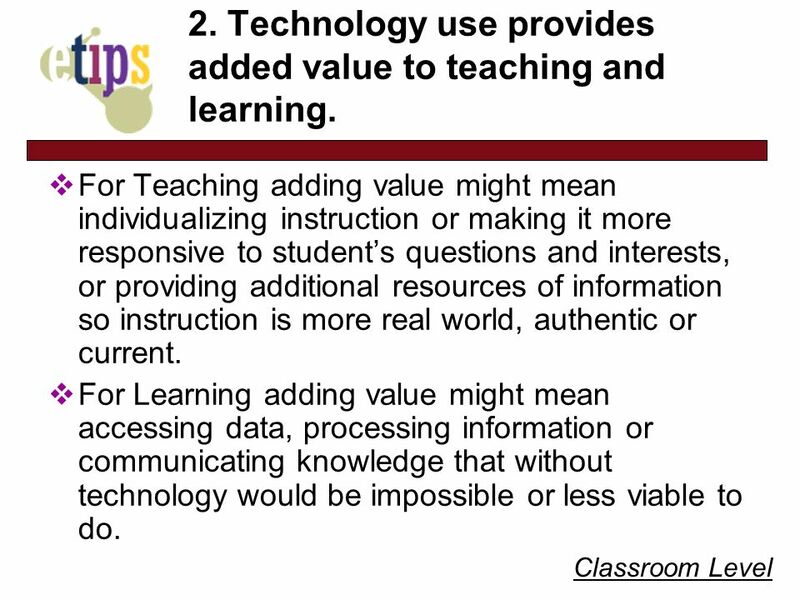 Technology use provides added value to teaching and learning. 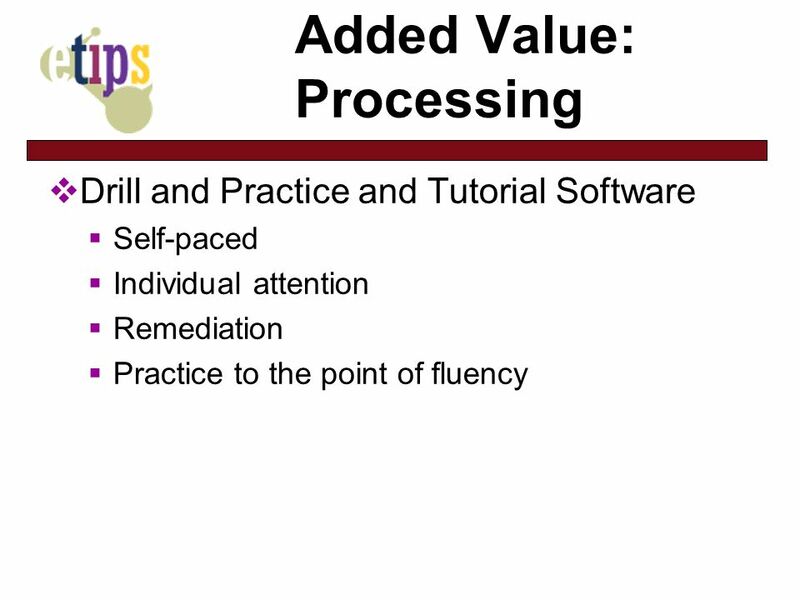 For Teaching adding value might mean individualizing instruction or making. E ducational T echnology I ntegration & Implementation P rinciples to guide teachers in their instructional decision making Sara Dexter University of Virginia. Friends Don’t Let Friends Learn Alone Dr. Robin L. Smith, MGRESA Professional Learning Coordinator Ms. Cyndi Barr, MGRESA Consultant. Understanding by Design Planning Instruction Stage Three Prepared for Mercer University EDUC621 by Sherah B. Carr, Ph.D Information adapted from training. Curriculum Writing Candace Wallace, Director of Curriculum & Testing June, 2009. A School Approach to Designing for Learning Learning Intentions : To know that purposefully designing for learning that is contextually appropriate, strengthens. 1 Friday May 26, 2006. 2 Inquiry-Based Lessons in the Technology-Rich Classroom Essential Question: How can teachers incorporate inquiry into the lesson-design.